Events - CARITAS - Shelter. Jobs. Recovery. Hope. Support CARITAS at one of these coming events! Join us for the annual College Emotional and Behavioral Health Institute (COBE) Town Hall. 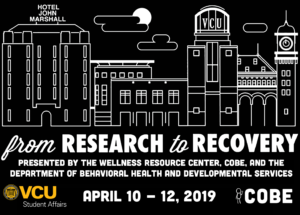 This event encompasses three days of learning from leading experts about the etiology, genetics, prevention, treatment, and recovery of alcohol and substance use disorders. This event is designed to be translational and open to everyone. We encourage individuals in recovery, individuals struggling with these disorders, families and friends of those affected by these disorders, students, researchers, clinicians, science communicators, poplicymakers, and journalists to attend! Thursday, April 25, 3-4 p.m.
Thursday, June 6, 3-4 p.m.
Every six weeks, CARITAS Graduates a new class of men and women from the CARITAS Works program. Join us as they accept certificates and share their stories of triumph and plans for the future. RSVP to Marilyn Milio mmilio@caritasva.org. CARITAS hosts a biweekly networking opportunity. Locations and times change. Please visit Synapse on Facebook for the latest times and opportunities. Look for “HUB019” for CARITAS times. RSVP via Facebook or email tterry@caritasva.org. Learn more about Synapse here. September 14, 10 a.m. – 5 p.m.
Join us for this annual event featured artists from around the country. Join the fun with the whole family. Enjoy raffles, live music, crafts, food, and more. Free to the public.